THE CHURCH IN AMERICA IS IN DECLINE. Christians don’t know or accept this demonstrable fact. They shy away from bad news. Every religious group touting the demographics of evangelicalism has been lying about the numbers for a very long time. In fact, based on published attendance figures, the church in America is about one fourth of the size claimed at best. 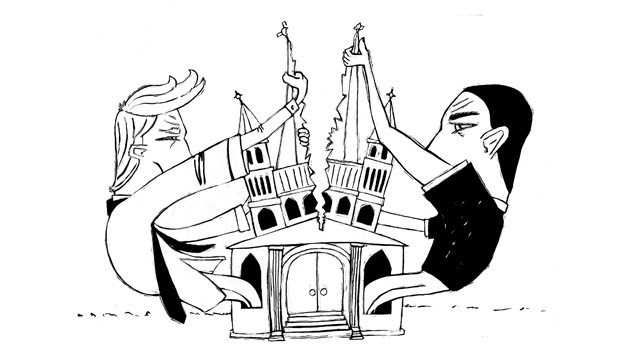 In addition, church membership is fragmenting in a serious and damaging manner. A recent Barna survey shows that Evangelicals comprise only 7% of our population, a fraction of the number claimed by Christian groups such as the National Association of Evangelicals. This is called lying. The rate of decline is about 2.6 million people per decade. This is extraordinarily significant because it is not a blip; it is an established trend. The number of new converts is abysmally low, and does not even come close to replenishing the empty pews. The American culture has also turned against the church. There is no better proof than the abject failure of the Southern Baptists’ recent eight year boycott of Disney. In that completely fruitless, protracted effort, Disney stock more than doubled. That is the culture sending a message to the churches: “You don’t matter!” The scandals and hustler’s persona of TV preachers in their three-piece white suits have not helped. So if you have not found church to be a relevant, edifying, uplifting, and educational experience, IT IS NOT YOU! IT IS T-H-E C-H-U-R-C-H ! Small groups that met in homes. No professional, career oriented professional clergy class living lavishly off the income of hard working church members. An understanding that tithing is NOT a New Testament doctrine, and that a monetary tithe is NOT found anywhere in the Bible. A realization that all monies collected in the First Century Church went to needy saints. A return to expository preaching and an end to passing elementary religious philosophy and pet peeves off as real preaching. Replacing the stack of bumper stickers in the hands of most church people that serves as their belief system with a sound Systematic Theology that is built up weekly. A return to the Book of Acts expression of Christianity that is characterized by a RELEVANT and EFFECTIVE INVOLVEMENT in the local community. Topical preaching will get a lot of “AMENS”, but they won’t build a person’s life. The concept of church membership is completely outside the original definition of the church. It stems from a desire to organize believers for purposes not central to the church, control, financial benefit, etc. 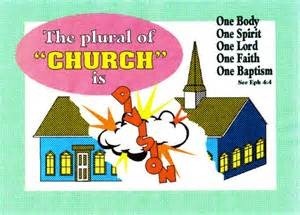 A church is an assembly according to the most basic definition of the term. All efforts to centralize power and authority have ended badly in the history of the church. 1. So let look at it this way. Most churches are incorporated, i.e. religio-corporate entities that need customer counts (members) and cash flow (offerings), and personnel (clergy, secretaries, office personal, etc. ), and a product line (SS material, programs, preaching, etc.). In recent decades, churches have leaned toward becoming “user friendly,” i.e. consumer oriented; hence the Walmartization of the church, wherein people pick and choose on the basis of preference, not orthodoxy. 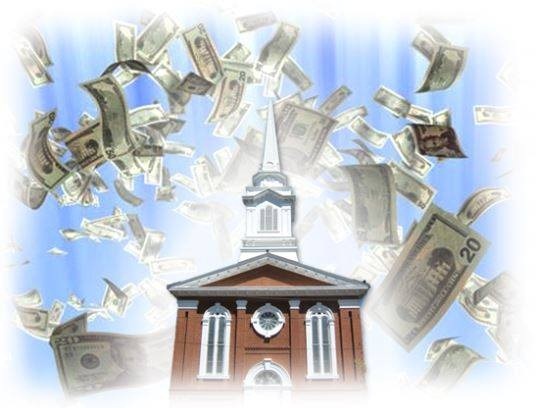 Adopting worldly fiscal strategies that guarantee “market share,” “market presence,” and “branding,” (The end of your search for a friendly church), dulls the senses of the religious consumer (believer), since the bombardment of ads and solicitations surround people nonstop, causing them to be largely inoculated from the core message. The only way to reverse this worldly fiscal trend is to get back to the basics, which means the First Century model. Corporations of all kinds exist to perpetuate their own furtherance, churches fall into this same rut, with believers stating their “product loyalty” (We’re Baptists, Methodist, Pentecostal, etc.) in contrast to other sectarian marketing preferences. No wonder Jesus mused if He will find faith in the earth when He returns. What better way to demonstrate the love of Christ than to meet the physical needs of the body? Jesus taught people AND fed them. He didn’t check credentials prior to eating with people, nor did He resent requests for help because the outgo might negatively impact His “income.” The reason the modern church is having so much financial trouble is because it has bought into the “money as blessings” lie of the world. God already told us that money is “uncertain,” I Timothy 6:17. A look at history, in particular the Reformation, we learn that such men as John Calvin, Martin Luther, John Knox, and the many other early reformers may have intended to reform the church but instead they ended up dividing it. 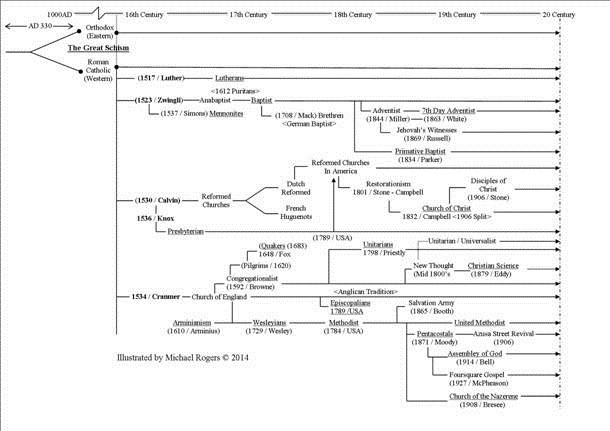 The Reformation birthed Protestantism which has become what I now call the “splinter denominations.” If you have ever wondered when the church started rapidly dividing, look at the overview of denominational splits in the flow chart below. Historically, the “Great Schism” points to the split between the Eastern Orthodox and the Western Roman Catholic church somewhere around the time of 1000 A.D. But, the rapid proliferation of church divisions begins in the 16th Century with the Reformation. It is the Reformation which has caused the present day 33,000 Christian denominations to form. Denominational Divisions are simply the by-product of reform. The Church cannot be reformed, it cannot be amended, it can only return to its founding principles taught by Christ our Lord and His Apostles. It can only return to the early Church Model outlined in the Acts. When you translate the Reformation’s Latin motto reformata et semper reformanda (“Reformed and always being reformed”) into its practical consequences, it becomes: “Divided and always being divided” (www.reenactingtheway.com). However, the single and most effective agent used to segregate the Church has been centralized authority in a select group of church leaders. The Restoration Movement known as the American Restoration Movement was a movement that began on the American frontier during the Second Great Awakening (1790-1870) of the early 19th century. The pioneers of this movement did not see themselves as establishing new denominations; rather, they sought to reform the church from within, seeking to restore the church and “the unification of all Christians” in a single body patterned after the New Testament. It has been described as the oldest ecumenical movement in America.2 The result? Out of this movement came the “Churches of Christ” denomination which of course in the last century has splintered off into other offshoot denominations. Again, reform fails only to give way to more division. During the end of the 19th century and into the early 20th century the eroding forces of rationalism led to a “break with the Bible” that expressed itself in religious liberalism. This movement in modern Protestantism emphasized freedom from tradition and authority and the adjustment of religious beliefs to scientific conceptions and the development of spiritual capacities began. Its earliest development is seen in the birth of Pentacostalism in 1871 and later realized in the Azusa Street Revival. It is interesting to note that two of the surviving schisms found between the Calvinist and Armenians exist today between the Baptist and Pentecostal denominations. The conflict between the Baptists “once saved always saved” and Pentecostals “you can lose your salvation” has been one of the biggest promoters of division in the Church. The earlier Pentecostal movement emphasized speaking in tongues according to the experience of the early church as evidence of the baptism of the Holy Spirit. They drew their membership from the Wesleyan holiness churches (Methodist) and in many cases from Reformed groups when they began. What began with the Reformation turned into a Spiritual Revolution in the 20th Century. The shackles of Religious oppression had been broken with civil rights and the security of religious freedom. The Schisms which began with the Reformation accelerated in the 20th century as all known denominations were splintering off into self promoting bodies. From the Wesleyians came the Methodist, out of which came both the Church of the Nazarene’s and Pentecostalism. From Pentecostalism the Assembly of God denomination was formed in 1914, the Foursquare Gospel in 1927, The Word of Faith in the 1940’s, the Charismatic Movement in the 1970’s to the present Charismania of the New Apostolic Reformation. All of which has cascaded into a present day spiritual mass hysteria. And not just with the Charismatic’s and Pentecostals but with the present Reformed Evangelicals and Ecumenical’s. What began with the Azusa Street Revival developed into “New Revelation.” Today, new revelation has morphed into New Age thought and practice Christianized and is being galvanized by the Emergent Church within the ranks of Charismatic’s, Evangelicals, and Ecumenical’s alike. So let’s rewind here for a moment. If the church in America is in decline and church membership is fragmenting in a serious and damaging manner, where are all the believers? 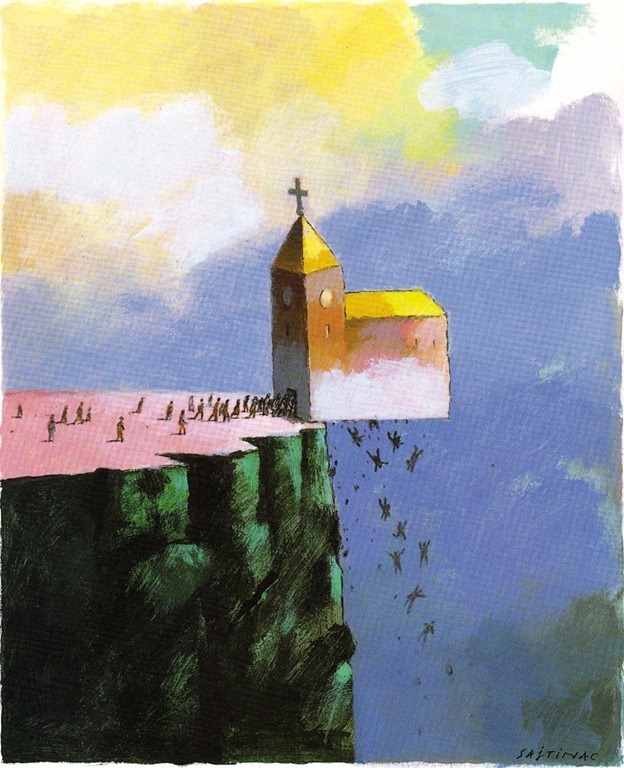 If you consider the number of people who have been ostracized, excommunicated, shunned, and forgotten by the Institution (Mainstream) Church, those who have slipped through the cracks, and those who have left because they have either been desensitized by the Spiritual abuse of the institutional church or have discernment of the false doctrines perpetrated by its leadership then the answer is obvious, they have become a the subculture Church. 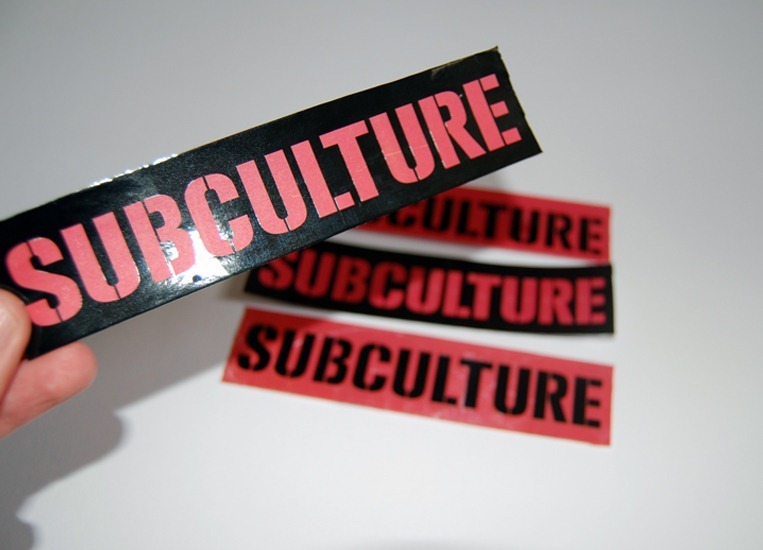 The next question is then, what is the subculture Church? It is a separate spiritual social body existing outside Mainstream Christianity. Some have developed a social structure around small home groups or coffee shops, others are connected through venues such as Facebook, blog sites, internet chat rooms, etc. Whatever the case, the subculture Church is seeking truth, growth, learning and connections with other believers through any means necessary to survive Spiritually. I call it a Subculture Church not because its subordinate to the I.C., nor because it’s not a viable part of the Body of Christ, it certainly is, but because from the I.C’s position it is almost invisible, undetectable. Ministry isn’t always well orchestrated or pretty. It’s doesn’t always happen on a drum roll, organ crescendo, altar call or standing or sitting in a pew quietly with one’s head bowed . Not that ministry doesn’t take place in or with these things, they certainly do. However there is the other side of “ministry” that is quite ugly, painfully real and raw that many inside the I.C. church walls may not even be aware of and have no understanding in. Thereby christening those of us in the subculture church as lunatic, thinking that we have no true understanding of the church that they are a part of ……not realizing or acknowledging that we the subculture were once sitting next to them in the same pew. We know and understand where they are at and at times miss and long for what use to be, but we also understand that it’s poison to us. Yet very few if any take the time to get a clear grasp of what we have gone through and especially where we are at now. Nor do they take the time to say let’s talk about this over coffee. More often than not, we in the Subculture Church are not even given so much as a glance by those in the mainstream. In my opinion, if they took notice and spent the time to understand, the challenge placed before them may cost more than they are willing to pay, so out of fear of loss they give no peripheral gaze. The reality is, if you peal back the stigma’s attached to the I.C. there is in some ways little difference between us, in others there is a great gulf fixed between us. This entry was posted in Institutional Church and tagged Church Division, Church Subculture, Subculture, The Great Schism by Mike Rogers. Bookmark the permalink. Forgive my ignorance… What does I.C. stand for? Also, would you mind emailing me your flowchart? for some reason, I cannot read it and it becomes blurry if I try to enlarge. No I live in Ohio. It’s very hard to find others where we live also. May be many are so hurt and wounded by it all they can’t deal with it at the moment. Keeping you in prayer that you will find someone, God is faithful. Great and truthful article! I wish I could find like-minded folks where I live but so far it’s been a struggle. Thanks godlee, your always an encouragement. It does seem a little crazy to split off from one group to create unity. How exactly does that work and how does it even make sense? That was a rhetorical question. Giving up sound doctrine is never a good idea and it is clearly against what Scripture teaches. You are right about the house churches, Pat and I have discovered many who have left the I.C. and have become atheist, others agnostic. Its scary to think about. We are in troubling and dangerous times, we must ever be vigilant and careful. Bob I totally understand, in the last six to seven years I have felt as though I’ve been wandering in a wilderness. The only thing that keeps my compass in view is Scripture and the testimony of others who are in the same place as we are. I so wish we were all close geographically so we may all embrace one another with the truth of Gods word and the Holy kiss of the God’s Spirit. But, we have places like this blog, Facebook, and other venues to which we can edify and encourage one another. For now I’m content, however I encourage you to keep trying to connect with others in your area! It is difficult for us both, but we have to keep tyring! God Bless. You all have done an incredible service to us sheep by doing all this research. This really helps piece it all together and helps us realize where we are in this point of history. We need to definitely get back to sound doctrine, which is mostly what the Presbytarians started out with (except for the infant baptism thing)—until they too went ecumenical. Alexander Campbell (founder of the Church of Christ) hated their exclusive doctrines of grace and split from them in an attempt to create “unity” by allowing goats easier access to the Lords Supper, etc. Unfortunately, this is also still happening in the “organic/simple” Church movement that’s held in houses. I was involved in one a few years ago because of my disgust with the I.C…… Only to be more disappointed than ever. But thank God that as long as He gives my husband and me likemindedness in our theology and a handful of others who know the truth as well….we are content. I understand the difficulty in gathering together after one or many disappointing experiences. We are daily praying about His will for fellowship. Seems like what was so simple for some 28 years of our adulthood has for 11 years been a continuing trial. God bless your work. No Bob I don’t know anyone in Iowa except you now lol. My wife and I are trying something new on Facebook. We started a page called Defiance Castaways in the hopes of drawing others like ourselves in the hopes of meeting and fellowshiping with others. Your welcome to check it out here https://www.facebook.com/pages/Defiance-Ohio-Spiritual-Castaways/451718648302005?ref=aymt_homepage_panel It’s a very hard thing as we do know people like ourselves but it appears they are so shattered over their experience in the I.C. to gather together is hard for them at this point. Shape sifting is the right term to us pnissila. Like you, my wife and myself well never return .” There’s a vast array of issue within the corporate (institutional church). The vast majority of pastors “preach Christ of contention” or easy believeism and a host of lies in between. They have a foul, prideful, self-serving, oppressive spirit, while others act sheepish hiding behind grace covering their eyes to the apparent apostasy you spoke of, AND they have for the most part remained silent for three or more decades in the face of legendary abuse, apostasy and corruption within their camps. It is a sad day indeed to see how far the professing church has fallen. Meanwhile, however, I have never been as close to the Lord or as hungry for His Word and guidance. I am also convinced it’s “remnant time.” And if the REMNANT were counted, I don’t think a counter in the world could keep up with our own (exponential) growth as more and more people are awakening to the hydra-like apostasy (or should it be apostasies) spreading like wildfire. Thank God for the Internet and the availability now of many of the even long-since-passed preachers and teachers of old whose recordings and videos are again available on a large scale, who understood expositional teaching and preaching. And who understood the Word of God. Couldn’t agree with you more. Do you know of any believers in Central Iowa that might be amenable to a New Testament gathering?